In “Molly’s Game,” writer/director Aaron Sorkin introduces us to Molly Bloom (Jessica Chastain), a complicated woman who’s all the more fascinating because she’s real. Smart, resourceful, competitive, driven — Molly succeeds at whatever she puts her mind to. At first, that’s skiing; pushed hard by her demanding father, Larry (Kevin Costner), she becomes an Olympic-level champion who seems destined for gold…until a random accident ends her skiing career for good. continue reading…. An impulsive move to L.A. leads to a job as the put-upon assistant of producer/promoter Dean Keith (Jeremy Strong), who runs a high-stakes underground poker game and enlists Molly to help. She learns the ropes quickly and eventually strikes out on her own, recruiting wealthy gamblers like Player X (Michael Cera), Douglas Downey (Chris O’Dowd), Harlan Eustice (Bill Camp), and many more. Half of them fall in love with her, but she keeps her distance; she’s cool, calm, and poised — always a professional. At least, that’s how it might look. But behind the scenes, Molly relies on ever-stronger drugs to keep herself alert and awake, and — supposedly unbeknownst to her — the Russian mafia has infiltrated her game. And that’s what ultimately leads to her arrest and a federal lawsuit. She turns to upstanding lawyer Charlie Jaffey (Idris Elba) for help, but he’s not sure he trusts her — or buys her story. MaryAnn Johanson Feminist in the best way, Molly’s Game isn’t just a movie that puts a woman at its center. It puts a woman at its center who is as complex, as contradictory, as confused as men always get to be onscreen. The film finds its feminism in obvious places, in how men underestimate or outright dismiss its female protagonist merely because she is a woman, and there’s definite go-girl triumph in how she overcomes that and gets small revenges. But there’s much more important feminism in how the film depicts Molly as someone who does not have it all together, who makes big mistakes, who falls into easy traps, who perhaps lets her ambition get the better of her. Who is, in other words, a fully human person. Read the full review. Cynthia Fuchs “This woman does not belong in a RICO indictment. She belongs on a box of Wheaties.” Attorney Charlie Jaffey (Idris Elba) gives a rousing speech near the end of Molly’s Game, one where he defends his client, Molly (Jessica Chastain), against a pair of government prosecutors. They want her to give up information on the men who played in her high stakes poker games. Charlie, it turns out, is borrowing his defense from his daughter Stella (Whitney Peak), who sees in Molly a role model and a hero. Read full review. Liz Whittemore With a writer like Aaron Sorkin you know you’re getting the kind of dialogue an actor can only dream about. For a director, Jessica Chastain is the kind of actress that will deliver every word with nothing but truth. Combining Sorkin’s script with Chastain’s performance for the screenwriter’s directorial debut is a sure bet. Molly’s Game is high stakes win for audiences. Sheila Roberts Jessica Chastain delivers a superb performance in “Molly’s Game,” filmmaker Aaron Sorkin’s tightly paced feature directorial debut inspired by the real-life story of poker princess Molly Bloom. Intelligently written and solidly helmed, this witty high stakes poker drama adapted by Sorkin from Bloom’s entertaining memoir features a strong supporting cast that includes Idris Elba, Michael Cera, Jeremy Strong and Kevin Costner. Chastain plays an ambitious former Olympic freestyle skier who draws on her competitive training to run a successful high-stakes poker empire in a male-dominated arena until her underground game becomes the target of an FBI investigation. Noteworthy is Chastain’s meticulous voice-over narration revealing her character’s mercurial rise and fall and Danish DP Charlotte Bruus Christensen’s exquisite cinematography. Nell Minow Molly Bloom made some bad mistakes and trusted some bad people but she refused to be anything less than trustworthy herself. Jessica Chastain shows us both her resolve and her vulnerability and the scene near the end with Kevin Costner as Bloom’s father is one of the best of the year. Jennifer Merin We’re starting off our new year of #MOTWs with a film that features a highly complex, completely fascinating and quite controversial truth-based character: Molly Bloom. 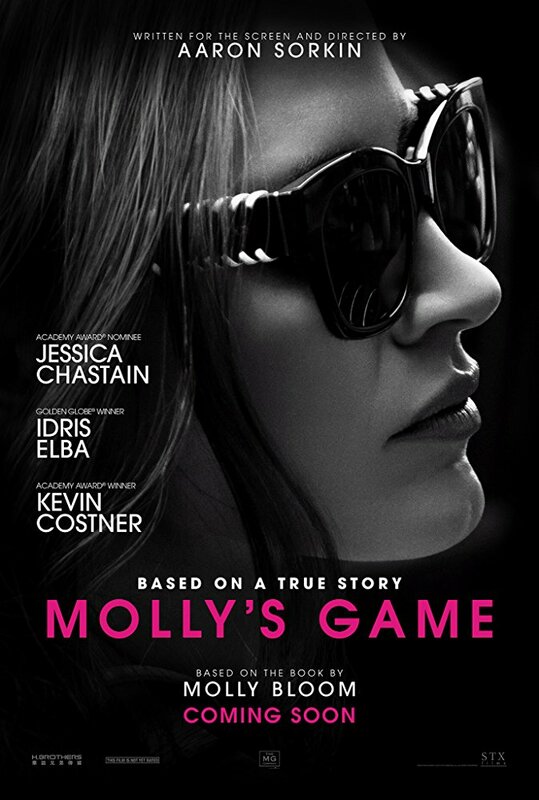 As written by Aaron Sorkin, who also makes his directorial debut with the film, MOLLY’S GAME introduces us to a young woman whose tremendous moxie and determination leads her down a path of unwise choices, and then allows us to watch her struggle to find a way out of the difficult circumstances in which she lands. Jessica Chastain’s performance certainly does justice to Molly’s quest. Anne Brodie Jessica Chastain delivers Aaron Sorkin’s densely worded script with lightning rapidity, quite a feat, as illegal gambling maven Molly Bloom. She’s smart, a go-getter, an ambitious Olympic skier who sustained a career-ending injury, and turned her talents and will to reading people. She was a quick study of human behaviour and found the perfect outlet. She developed a world class travelling poker game using that Olympian focus. Her games were legendary, attracting international celebrities, politicians, the heaviest hitters, she made money hand over fist and managed to stay below law enforcement radar. Sorkin’s trademark fast talk mirrors the pace of action in this, his directorial debut. Everything about the film is fast; it’s fun and exciting and at times, head spinning. However, an hour of fast talk in a TV series is cool, almost two and a half hours in a film is wearing. Good thing the true story is interesting. Pam Grady For his directorial debut, Aaron Sorkin makes a curious choice in adapting Molly Bloom’s book about her life running poker games that led to brushes with Hollywood players, the Russian and Italian mobs, and eventually a federal indictment. He leans so heavily on star Jessica Chastain’s voiceover narration, explaining Bloom’s life and career in excruciating detail, that at times it seems as if he is directing an audio book instead of a movie. But the director forgetting that it’s better to show than to tell is not Molly’s Game‘s biggest problem. It’s the inherent lack of drama as Sorkin fails to make either Molly’s life in LA and New York’s gambling circles or the legal quicksand that envelops her interesting. And for all of Molly’s nattering about her situation on the soundtrack, legal strategizing with her lawyer Charlie Jaffey (a wasted Idris Elba), and illustrations of her daddy issues with her psychologist father Larry (Kevin Costner), she never comes into clear focus. Sorkin wants to portray her as a righteous paragon of virtue (hammering the point home with allusions to Arthur Miller’s play The Crucible and its falsely accused witches), an image at odds with her own narration that makes it crystal clear she knew what kind of a seamy world she had entered from the start and chose to make her living there, anyway.